The Dalhousie Accent Clinic is the only university-based clinic of its kind in Atlantic Canada. Learn about our services. 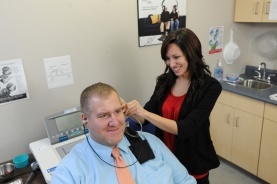 The Dalhousie Audiology Clinic provides hearing assessment services for children and adults. A doctor’s referral is not required. Learn more about our services. The Dalhousie Neuroaudiology Clinic offers advanced audiological testing of both the peripheral and central auditory system, such as testing for auditory processing disorders. Learn more about our services. The Dalhousie Aphasia Clinic operates through the School of Communication Sciences and Disorders. The clinic offers a variety of programs for adults with aphasia. Learn more about our services. The Dalhousie Hearing Aid Assistance Program provides donated hearing aids to adults who cannot afford to buy new hearing aids. An application process is required. Learn more about our services.